For most Australians, with our sun exposure and the strength of the sun, skin pigmentation/hyperpigmentation is a condition that’s unavoidable. Hyperpigmentation affects every skin tone, and because Australia is at a higher UV risk, our skin is even more prone to developing hyperpigmentation, which not only ages us, but can be an indicator for skin cancer. EstheWhite and EstheShield are new natural ingestible supplements that can be taken concurrently, daily, to help protect your skin from sun damage, while maintaining an even tone, and brighter complexion. EstheWhite’s key active ingredient, PhytoflORAL®, is a patented dietary supplement derived from a source of non-GMO tomato species that is rich in colourless carotenoids. These specific carotenoids help to lighten and even out skin tone through inhibiting melanin production, protecting against UVA/UVB rays, and helping to significantly increase anti-inflammatory and anti-oxidant processes, without bleaching or staining your skin. 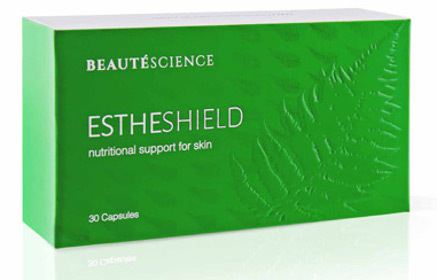 EstheShield’s core ingredient is a proven natural fern extract – Polypodium Leucotomos, a chemophoto-protective agent that has been found to be effective in helping to protect the skin against UV radiation when taken orally#. Polypodium extract has both antioxidant and anti-inflammatory properties that help to inhibit and prevent free radicals in the skin from causing long-term DNA damage and photo-ageing. Clinical studies on the effects of colourless carotenoids, have shown that 59%-86% of the subjects’ skin quality significantly improved after 6 weeks, and up to 90% of the subjects had improvement in skin dryness, roughness, suppleness, evenness and texture after 12 weeks*. I’ve been using the EstheWhite and EstheShield duo for a month, and although this is not a clinical study, I can see a significant improvement in pigmentation I have around my forehead due to sun exposure. The capsules have made a huge improvement to my pigmentation in just 4 weeks, although a minimum three month useage is recommended for full results. Head over to Instagram to see the before and after results (@beautyover40au). 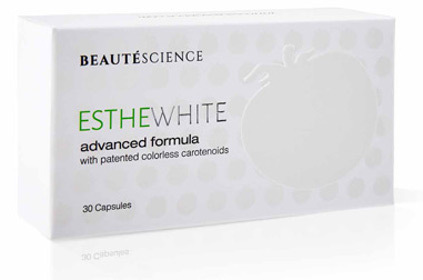 EstheWhite/EstheShield 30 Capsules each RRP $180.00.